Crescent Diagnostics Ltd, (“Crescent”) a developer of novel tests for predicting osteoporotic fracture risk, has raised Euro 1.5 million to support the development of BQT®, a predictive test for the disease. The funding round was a syndicated deal between AIB Seed Capital Fund co-managed by Enterprise Equity Venture Capital, Bank of Ireland Seed Fund managed by Kernel Capital, and existing venture investor Seroba BioVentures. The funds will be used to run additional clinical trials and to advance BQT® to regulatory approval in both the US and EU. 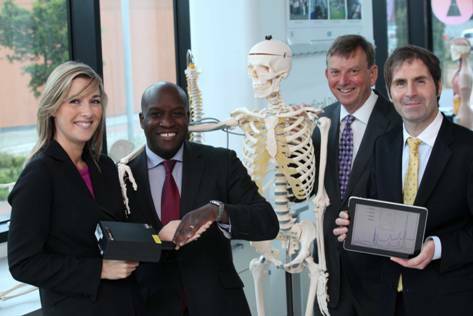 Crescent’s novel test, developed at the University of Limerick, will enable physicians to diagnose the risk of osteoporosis-related fracture both quickly and easily, using a small nail clipping. The BQT® analyser uses Raman spectroscopy to examine the chemical bonds in the toenail. Crescent’s research has shown that the structure and quantity of the chemical bonds in the human toenail is indicative of future hip fracture risk and is independent of bone mineral density (BMD), the standard test today. When BQT® test development is complete, a physician will be able to send a nail clipping to a laboratory for analysis, with results made available to the patient within a matter of days. More than 300,000 people in Ireland have osteoporosis and one in two women over 50 are at-risk of a fragility fracture which can cost up to €12,600 to treat. The current gold standard screening method, Dual X-ray Absorptiometry (DXA), is costly, time consuming for patients and only assesses BMD, which is just one of many risk factors contributing to bone fractures. Many patients with acceptable DXA values still suffer fractures and more accurate tests for fracture risk are therefore required. Crescent Diagnostics is a diagnostics company which has developed a novel and convenient predictive test for early assessment of hip fracture. The company uses technology developed at the University of Limerick in Ireland, and is working to commercialise the BQT® technology in the US and Europe. Enterprise Equity Venture Capital provides venture capital to new and expanding companies throughout Ireland. The company’s objective is to stimulate viable and self-sustaining growth in the private sector through investment in well managed early stage and growth orientated companies across a wide range of sectors of technology, multimedia, wireless, food and medical devices. Established in 1987, Enterprise Equity Venture Capital has, to date, invested €40 million in over 60 companies and now co-manages the AIB Seed Capital Fund of €53 million on a nationwide basis. This fund was established in 2007 and invests in high growth start-ups and early stage companies. The fund’s limited partners are AIB Bank and Enterprise Ireland. Enterprise Equity Venture Capital has offices in Dublin, Galway, Cork and Dundalk.